Corpus Christi: The King(dom) is here! The feast of Corpus Christi (Body of Christ) celebrates the real presence of Jesus in the Eucharist, his Body and Blood, Soul and Divinity. This feast represents something of a high point, drawing out and celebrating the full force of the Paschal Mystery: Jesus defeats death and sin and rises to new life on Easter Sunday; after his Ascension, he and the Father send the Holy Spirit (cf. John 15:26; 16:7) at Pentecost, followed by Trinity Sunday and then Corpus Christi. The Trinity is the eternal communication of the divine nature from Father to Son, and through the loving embrace of Father and Son, the Holy Spirit proceeding forth from them both. 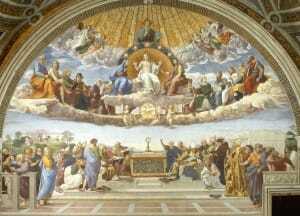 This is the immanent Trinity, God’s own inner life from all eternity. The economic Trinity concerns God’s going outside of himself, in his works of creation and redemption. In the Paschal Mystery, we see the sending of the Son and the Spirit, which extends and prolongs these internal processions within God into time (cf. Scheeben, Mysteries of Christianity, 481). The sacraments, quintessentially the Eucharist, make present the Paschal Mystery and bring us up into this inner dynamic of life and love. Let us now take a look at the Eucharist through the biblical lens of the manna and Holy of Holies. God liberated Israel from Egypt in the Exodus, but for life in the Promised Land. The manna is precisely that food for the journey that sustained Israel after the Exodus, en route to the Promised Land. And in fact, the manna ceased when the Israelites finally arrived (Joshua 5:12). Keep in mind that the manna was no ordinary bread, but “bread of angels” (Psalm 78:24-25) which miraculously fell daily—(a point that may lie behind the petition “Give us our daily bread,” (read Brant Pitre’s Jewish Roots, 93-7). Jesus clearly stated that this ancient manna foreshadowed the Eucharist, announcing the superiority of the latter: “Your fathers ate manna in the wilderness, and they died. This [the Eucharist] is the bread that comes down from heaven, so that one may eat of it and not die” (John 6:49). We also find a similar link between Jesus’ multiplication of the loaves and the Last Supper: the same four verbs in Greek recur (lambano [take/took], eulogeo [blessed], klao [broke], didomi [gave]) (Matthew 14:19; 26:26). In fact, there is a Church at Tabgha on the Sea of Galilee dating back to the fourth century, which marks the site of the multiplication of the loaves; in this Church, there is a Mosaic with only four loaves of bread (not five, as in the story, cf. Matthew 14:17); the point is clear: the fifth one is on the altar! Clearly, these fourth-century Christians and the Gospel writers viewed the multiplication of the loaves as prefiguring a greater miracle to come, namely, the Holy Eucharist. In the Letter to the Hebrews, there is an allusion to the curtain that separated the Holy of Holies from the Holy Place in the Temple. In Hebrews, the earthly Temple gives way to the heavenly; and the curtain through which we pass to enter the heavenly Holy of Holies is none other than the risen flesh of Jesus Christ: “we enter … by the blood of Jesus, by the new and living way … through the curtain, that is, through his flesh” (Hebrews 10:20). Through the Eucharist, we pass into something greater than the ancient Holy of Holies—through Christ’s risen flesh in the Eucharist, we pass into the heavenly Holy of Holies, whereby we have hope that we may eat and “live forever” (John 6:51; cf. Genesis 3:22b). Wherever the King is, there is the Kingdom; and in the Eucharist, the King is present—as is his Kingdom. Jesus won’t have one ounce more glory at the end of time than he does right now in the Eucharist; the difference will only be in our ability to see. This article first appeared on The Great Adventure Blog June 2015.